Pavol Lisy 1p (right) of Slovakia has become the first-ever professional go player appointed by a European body, after adding two more wins at Amsterdam on Thursday May 29 to his two at Strasbourg the week before (see First Knockouts in Euro Pro Qualifications, 5/26 EJ) in the First European Pro Qualification Tournament. The third and final stage of the tournament, which will see the appointment of a second European Pro, will be held in Vienna on June 20, where those who have only lost one game so far will compete in two further knockout rounds for the prize of professional status. Lisy, who was a 7d amateur Slovakian Go Champion 2010-2014 and twice European Under-20 Champion, started playing go at age five. He previously had a hobby collecting beer bottle caps, of which he had thousands, mostly brown and white ones, and his father made a paper go board and used the bottle caps as go stones to introduce his son to the game. 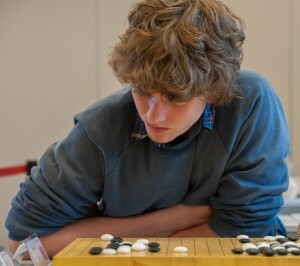 The tournament is the result of an agreement (pdf, 6.85Mb) between the European Go Federation and the Beijing Zong Yi Yuan Cheng Culture Communication Co. Ltd. (“CEGO”), who describe themselves as “investors who themselves are Go friends [who] believe on (sic) the future development of European Go and are willing to commit themselves to promote Go [...] in the West“. The agreement is aimed at the establishment of a full professional European go system and at enhancing the popularity of, and increasing the audience for go in Europe. Click here for full tournament details, including results table, player profiles and the rules and constitution, and here to see the record of Lisy’s fourth round, clinching game with Cornel Burzo 6d of Romania. 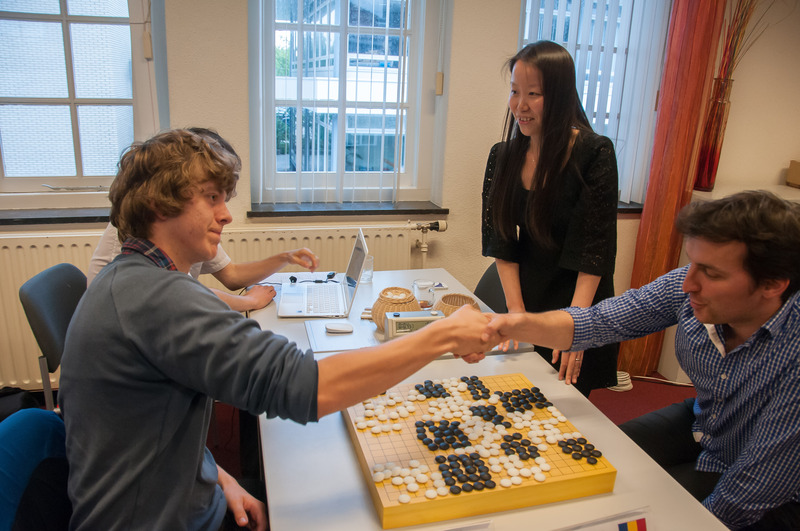 Report by Tony Collman, photos by Harry van der Krogt: (lower left) Cornel Burzo 6d (right) congratulates Lisy on the 7.5 point win that secured him professional status.